I love YouTube. For the last 5 years, I’ve used it daily for learning new skills, trying new recipes and keeping up my exercise goals. When there’s a question popped up, I would search on YouTube and learn from the videos. It has become a big part of my life and has changed greatly how I spend leisure time and how I grow my knowledge. Once logged-in, I see a list of recommended videos at the top of the homepage and a mix of subscribed & not-subscribed channels below. It’s hard to know what content has just presented to me: is it a list of new videos from channels that I subscribed to? Is it a list of recommended videos based on my subscriptions? or is it a list of my subscribed channels? How did it decide what channels to show up first? Besides the “What” question, there is also the “How” question. 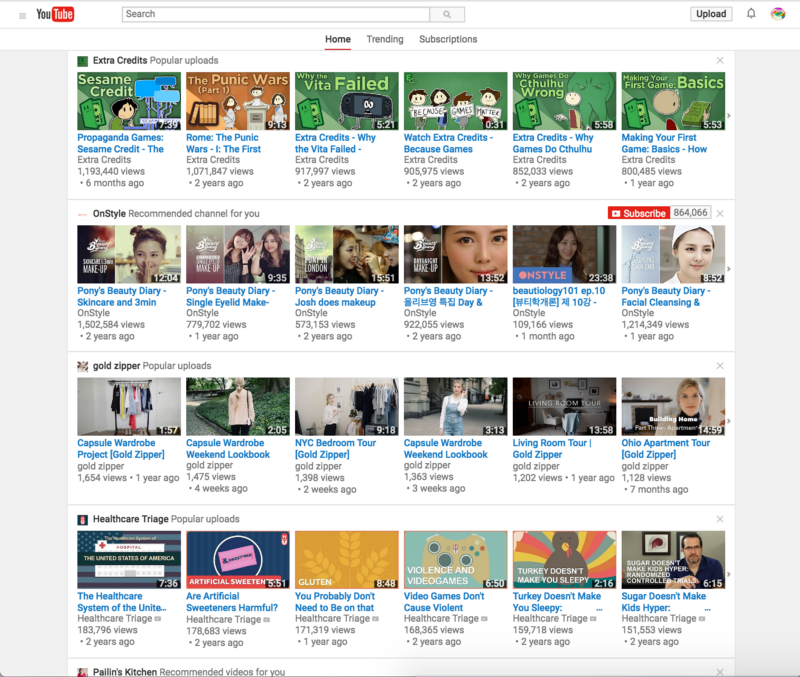 Since videos are organized only by channels, users have to weed through many irrelevant videos to find the one that matches the point of interest. For example, I subscribed to a wide range of topics from earth science to PyCon to making ultimate grill cheese sandwiches with chef John. If I’m in the mood of learning new tech, I have to scroll through lots of food videos before finding a relevant video. In short, how the videos are presented is quite inefficient. 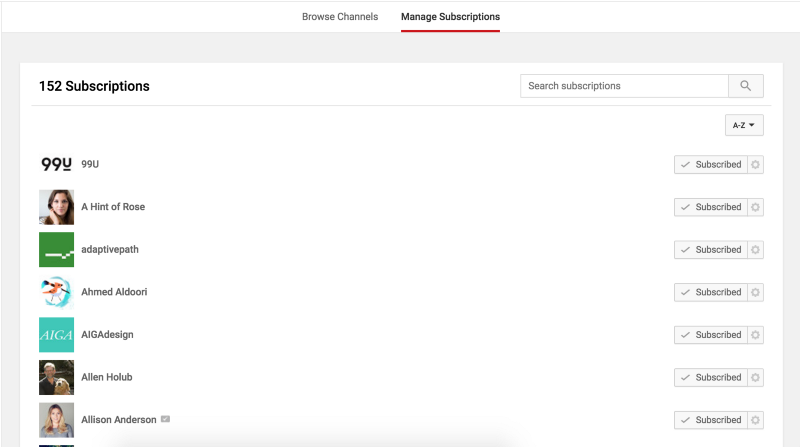 After 5 years of using YouTube, I’ve subscribed t0 almost 300 channels. After some (painful) pruning, I am finally down to 152 with some angry rants about the subscription management. As weird as it sounds, after subscribing hundreds of channels, I forget most of what I have subscribed. As seen in the picture above, most of the time it’s really hard to know what a channel is about simply from its name. On click event of the name, it brings you to the channel detail page which takes you out of the context of the subscription manager, resulting a very inefficient way to unsubscribe channels. Like I mentioned above, there isn’t a good way to organize subscriptions. You can’t group them, see their categories nor bulk delete. What comes down to is a dump of channel names, with a subscribe/unsubscribed button that isn’t useful unless the user knows what the channel is about. The same organizational issue applies to the subscription tab on the homepage, where it displays a list of subscriptions in chronological order instead of by categories. If I want to watch a good programming talk, it takes lots of scrolling and clicking to find one that applies to the current interest. One should never complain without giving a solution. Since all I have done so far is whine, I am curious about how I would solve the problems if they were presented to me. Disclaimer: Qualitative/Quantitative data should be gathered before a re-design. It’s a bad idea to change interface based on sole user’s feedback(like what I’m doing now!). I am also ignorant about all the business requirements/design constraints YouTube team has at hand. These exercises are simply served to start a discussion. 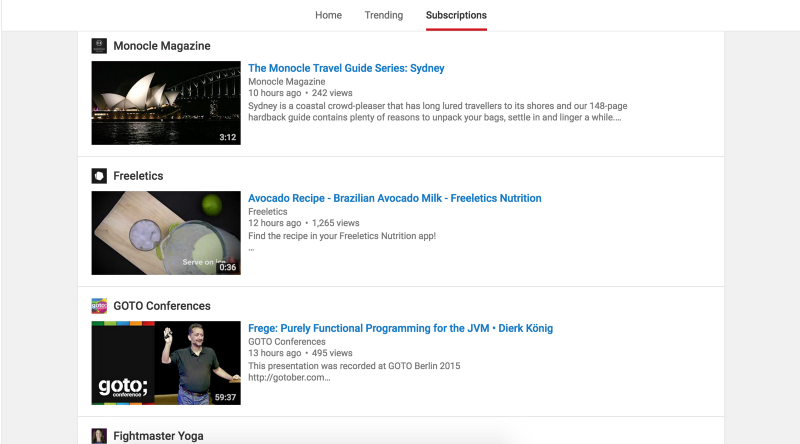 If a user has caught up on all the new videos from subscribed channels, the UI will display recommended videos in each category. Those videos are indicated by a black ‘+’ icon on the top left of a thumbnail. Notice the recommended section on the top is gone. Personally, I really dislike that section for reasons that it either shows videos I’ve watched, or shows videos I really don’t care; It is also positioned very high up in the visual hierarchy for its secondary nature. What should I unsubscribe? What channel do I watch the least? What channel is the most outdated? What channel do I spend the most time on, and the least time on? To answer these questions in my head, I added some details to the subscriptions list to help to make decisions on unsubscribing/subscribing a channel easier. By clicking on the category header in the Main Navigation (Technology in this case), user lands on the subscriptions management page scoped to the category. Since Table is great for scanning data, I decided to keep it but enhance with last watched, last updated and total watched time. Last watched is a timestamp of when I watched a video recently; Last updated is a timestamp of when the channel uploaded a new video; Total watched time is an accumulated time of how long I have spent watching a channel since the beginning of time — not really, but you know what I mean 😃. There are a lot more other stats that would empower me greatly as a YouTube user, such as what’s my average video length? do I always finish a video from the beginning to the end? I think there are some interesting questions to be answered. I love YouTube empowers everyone to become a content creator, I love it helps my personal growth and I love how it makes the world so much approachable. This long post is not only to share my personal obsession on the UI/UX, but also hopefully to help YouTube to be even better.